American modernist artist Man Ray designed this set in 1920 using pieces found around his studio. Only a few were ever made; this re-issue is based on a set currently on display at the Metropolitan Museum of Art. Only in the South are silk pajamas for the winter not considered entirely impractical. You can pick up the shirt here and the pants here. This is too clever and cute manly. *not a$tronomical… hip hip hurray! the most helpful grenade, ever. *images courtesy of online.wsj.com, jcrew.com and rockys2v.com, respectively. i’ve been on the prowl for a bright green coat. i recently managed to snap up a similarly hued apple green silk ralph lauren dress, but no luck on the coat front, so far. ...and this is what's in my budget. "pretty edgy" by essie, $8. *first three images property of tommy ton; final image property of essie.com. i have been a bit behind in posting my recent purchases… so here goes. – newest purchase, literally. 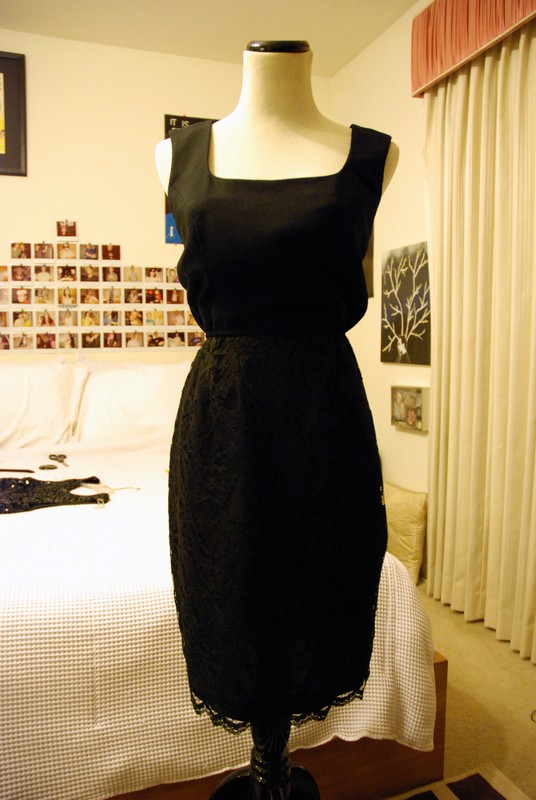 i just bought this today, and it is also one of the newer (read: non-vintage) pieces in my closet. the high-waist, black wool + silk skirt is as gorgeous as the jacket; it is extremely and insanely long, and floats away from the body as you move. it has detailed, body-conscious darting in the back, as well as a 14-button closure. no zippers. 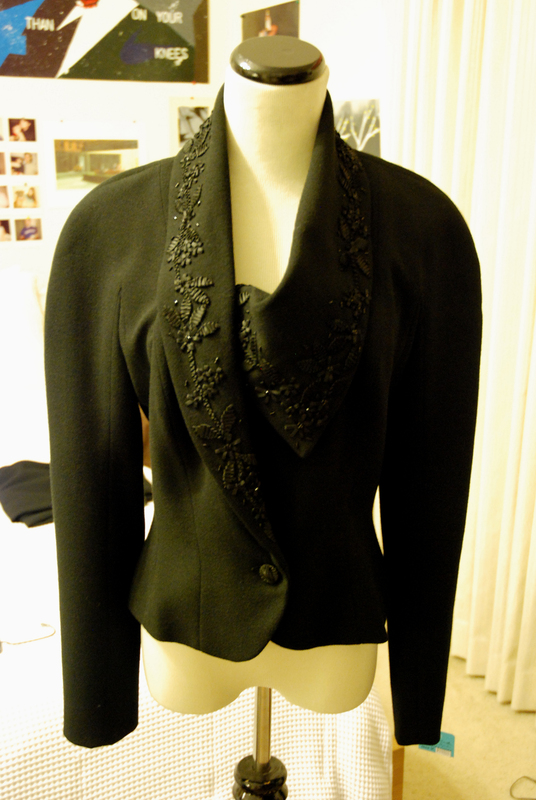 john galliano jacket - unbuttoned. 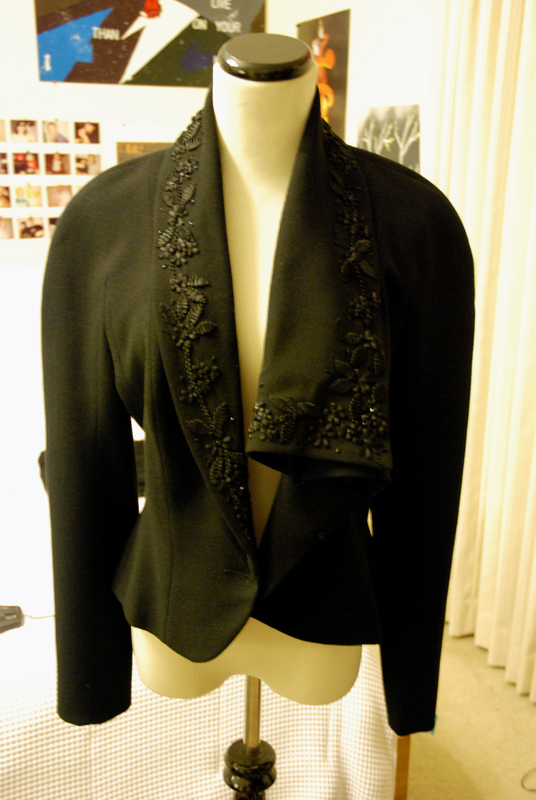 john galliano jacket - buttoned. 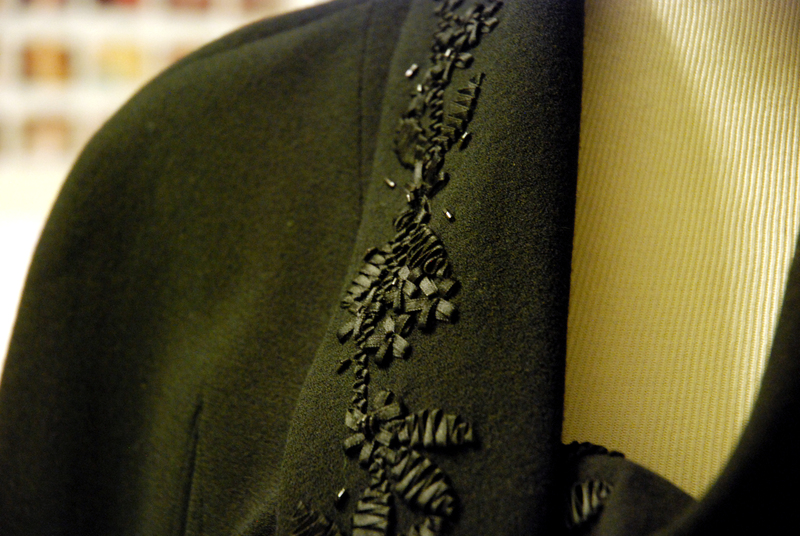 suit ribbon + beading detail. adrienne vittadini dress - front. adrienne vittadini dress - back. – the lace skirt of this dress has a beautiful scalloped edge that extends a little over the lining. the seam along the right side of the skirt was torn about 6 inches, but i easily stitched it back together. – this is such an unusual color for a leather jacket, and is unbelievably soft. 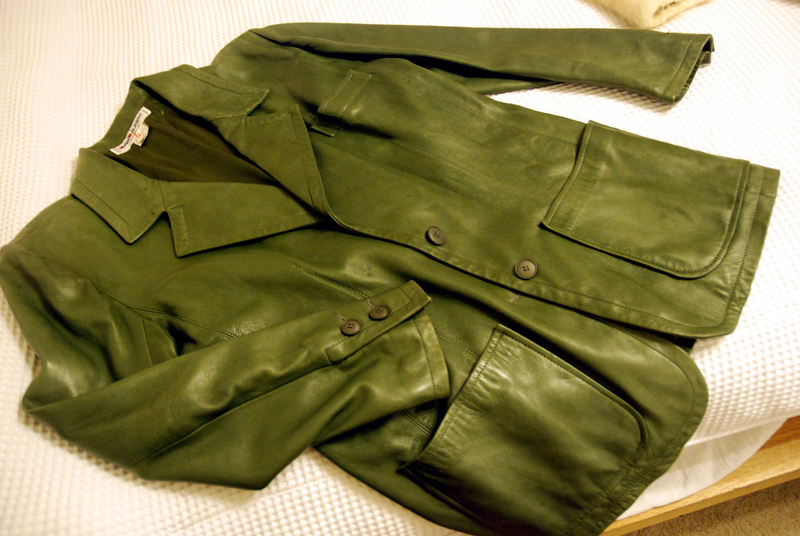 – you can’t tell from the photo, but this coat is in need of some restoration. there is a long split in the pelt on one sleeve, and there are two or three additional very small separations between pelts here and there. the condition of the fur itself, however, is excellent – super soft, with no stains, bald patches, or signs of wear along the pockets, collar, sleeves, or hem. 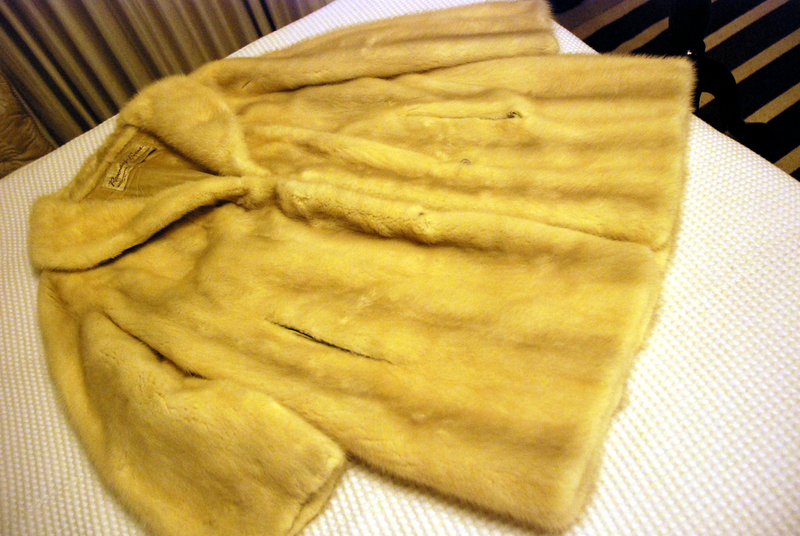 (these are all things you should check for or ask about before purchasing a vintage fur!) i called sakowitz to get a quote on how much a repairs would cost, and after presenting my find at the register, was given a rewarding discount. hopefully this coat will be getting some much deserved TLC soon! – i was told that the owner of the shop i bought this from purchased this in person on a trip to afghanistan several years ago. 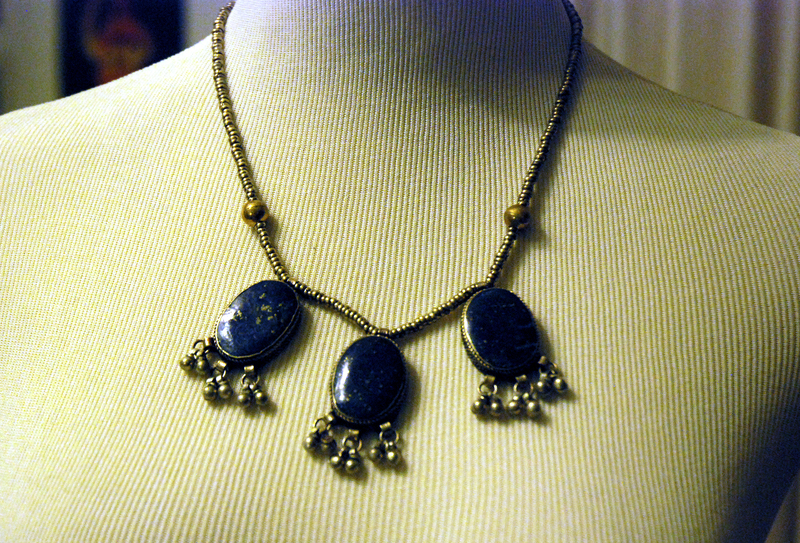 afghan silver & bronze lapis necklace. – whoops! almost forgot this one… (below par photo taken with my blackberry). 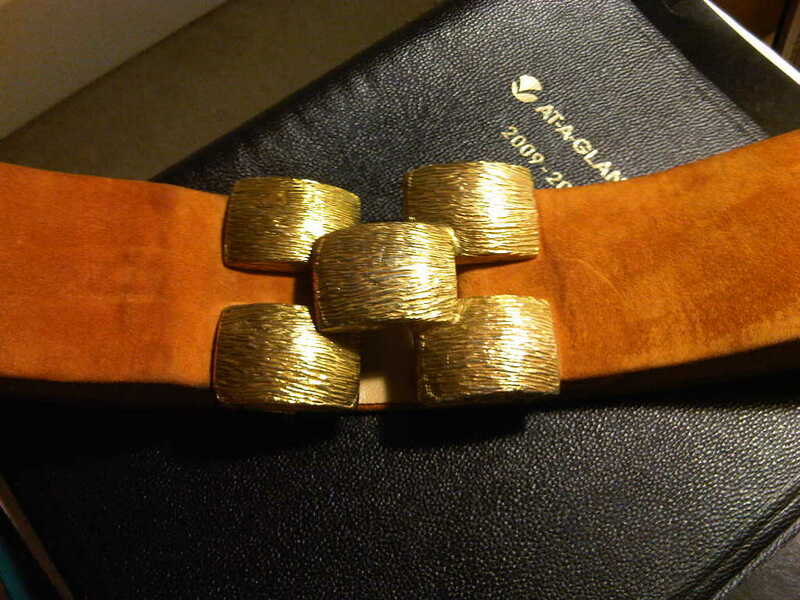 yves saint laurent belt buckle. a bit of time was set aside today to be spent with mandy & jimmy. after a quick lunch with jimmy at empire cafe, mandy met up with us, and we window shopped along westheimer & kirby. happily, we all came away with something – mandy nabbed a lovely pair of cream and white vintage nine west loafers, jimmy found two vintage ties, a silk christian dior, the other an yves saint laurent. me? i got my hands on an amazing silver reindeer suede and silk-lined skirt suit set by donna karan. which reminds me… i haven’t done a “recent purchase post” in some time. a few days ago, i finally managed to find a suitable leopard print to add to my closet – a vintage silk maggie london wrap dress. additional recent purchases: (L-R) sterling & garnet scatter cocktail ring, vintage sterling plaque bracelet printed with the word “risk”, 10k white gold and natural diamond aquarius pendant necklace, and 10k yellow gold and natural emerald and ruby strawberry pendant, an early christmas gift from my parents. lunch + testing out my blackberry camera. Posted in fashion (men), fashion (women), misc. my uncanny luck at sniffing out vintage is only serving to feed the vintage monster known as my closet. …or get a bigger closet. worth squeezing into my closet. forget “lucky in love” – i’m on a “lucky in red” streak. recent purchase post: today i brought home a lovely vintage red silk robe by neiman marcus. i’ll probably wear it as a dress – i really wasn’t sure at first which it was, since it’s listed as a size “P”, and has normal side pockets, instead of the usual front pockets that robes have. 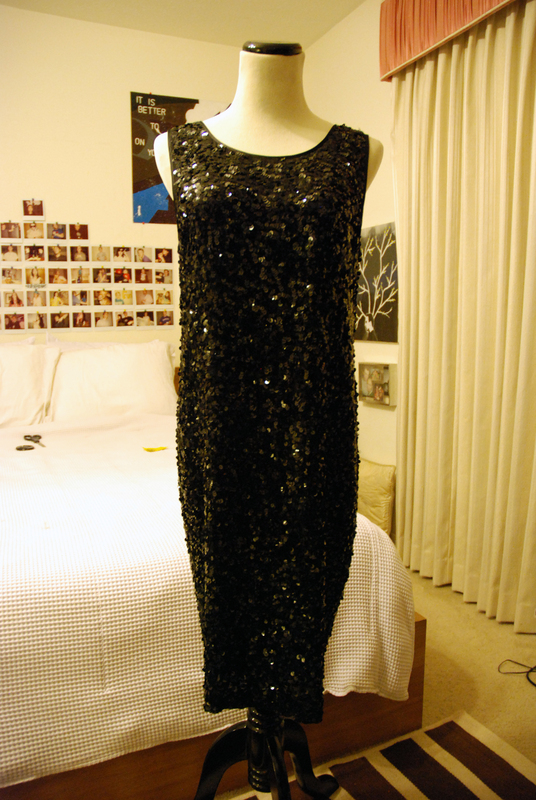 i also bought a mint [condition] long black column dress by emanuel ungaro, which i’d venture to guess is circa late 90’s, and finally, last but not least and best: a vintage three-piece ensemble of black sequins. 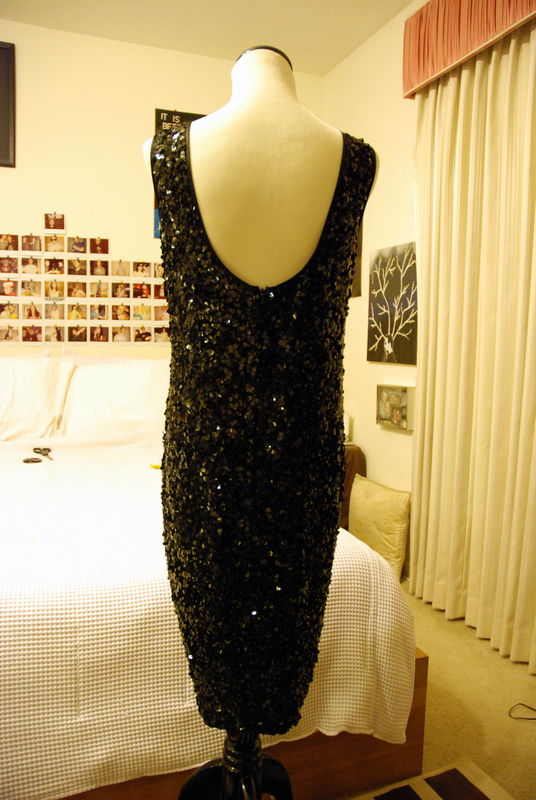 it consisted of a black silk sequined skirt, a black silk sequined vest, and a black cropped, see-through, puffed and sequin-shouldered bolero. ahhh-mazing. even better, when i got home and separated them (i’m not totally crazy – i wouldn’t wear them together), i realized the bolero was of a different maker… they had combined it with the vest and skirt on accident. sweet. with the claws of the fall semester already visible around the corner, i must admit i’ve been feeling less than inspired. in addition, i’ve been busy as a bee running errands all over houston; hardly conducive to craft work. however, the mundane drag of life the last week or so has afforded me the opportunity to notice the mundanely humorous things: two days ago, i was behind a woman in a black mercedes e320 whose license plate read, “4MYWIF”. awww. the other day at the gym (lifetime fitness), my cousin and i were pumpin’ the iron, when she noticed a class going on and suggested, “we should sign up for that – latin dance!” [respectful pause] hopefully, anyone who knows me has finished laughing or grimacing – either response is appropriate. for those who don’t know me, gloria cheng does not dance. 4 years at texas a&m, and i still don’t country dance, and at clubs (which suddenly lost their appeal after i turned 21), i bench myself on the sidelines. once we finished our iron pumping, we headed to the women’s locker room – it was then that i saw it… a flyer sitting on the end of the bench closest to my locker: “Flashback 80’s Aerobic Jam”. yes! 80’s dance is negotiable – unfortunately, my cousin disagreed. hopefully, i’ll rise out of my creative funk soon – with my mental cohorts still cavorting about the country and the globe, and the upcoming semester forcing me to rethink my immediate priorities, i’ve had little feedback or time to really develop ideas. all in good time, i suppose. vintage red silk neiman marcus robe/dress. tee hee - 80's jam.